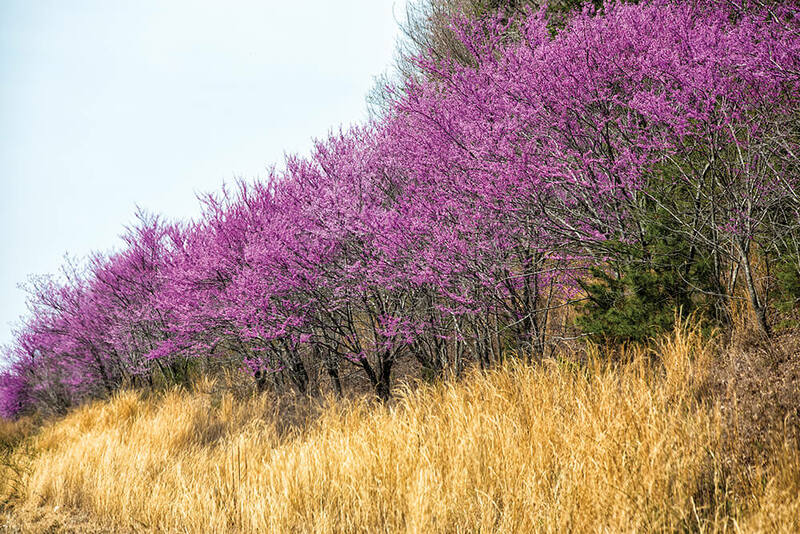 Magenta redbud blooms dot the woods in early spring, building to a crescendo of pink blossoms. I can’t say that I’m a serious classical music fan, but I did have a brief, intense fling with Aaron Copland’s addictive ballet and orchestral suite Appalachian Spring a few years ago. You may know the piece. It’s the musical score to American dreaming, with melodies rising and falling like suffusing sunlight, and a joyful rendition of the Shaker staple “Simple Gifts” wedged into the mix. It’s an easy piece to love. I tripped across Appalachian Spring almost 30 years ago — that’s “a few,” right? — just as I was getting serious about fly-fishing. I was pulling long weekend camping trips to high-elevation trout waters during that spring and summer. It was a heady time, fueled by this crazy new love. Fly-fishing for trout gave me a fresh frame of reference through which to view mountains and creeks and rocks in entirely new ways. I’d seen plenty of mountain streams before, but I’d never looked at them with a fly-fisherman’s perspective. All things old were new again. Not coincidentally, I suppose, it was about this time when I first noticed eastern redbuds. So here’s the scene: With the stereo cranked to full volume and violins rattling the speakers, I would careen at scary speeds around the gravel roads in Pisgah National Forest. Descending into deep river valleys, I was amazed by these flowering trees that seemed to line the mountainsides in great magenta fire bursts. Curve after curve, they were everywhere, staccato explosions of a funky pinkish-purple color, almost a visual percussion to underscore the masterpiece that thumped at an obnoxious volume out the open windows of my red Subaru. Empty drink cans and wadded-up fast-food bags tumbled around the car floor, side to side, as I half-skidded down the roads, trying to beat everyone else to the next trout stream, air-conducting the orchestra with a single Funyun gripped baton-like between thumb and forefinger. Or this scene: I’d cap a rise in the trail or scramble over a stream boulder, whistling ‘Tis the gift to be simple, ‘Tis the gift to be free, only to be struck still and silent by a single redbud, blooming in a sea of spring-green hardwood trees like a lone cymbal note struck in the midst of dying strains of music. Appalachian Spring was the score to my early love affair with fly-fishing for trout, and redbuds were there all along. To be honest, my dalliance with classical music was short-lived, so don’t be overly impressed with my cultivated ways. My musical inclinations at the time ran more naturally to Molly Hatchet than to Copland’s lively score of a contemporary ballet. I tried to nourish my refined musical tastes. I bought a couple of Beethoven and Mozart tapes. But it didn’t take. By summer’s end, I was back to a steady diet of 38 Special, George Thorogood, and a few favorite Southern big-hair bands. I guess I got over all the violins and kettledrums. But I’ve never gotten over the redbuds. In my tree books, it seems that the experts are divided as to whether the eastern redbud is a large shrub or a small tree. That’s a tough cross to bear. Neither seems to inspire a congratulatory slap on the trunk, not to mention the fact that many older folks call the redbud the “Judas tree,” based on the tradition that Judas Iscariot, the betrayer, hanged himself from a redbud. (The legend is actually based on a European and west Asian redbud, but the bad rap spread far and wide.) 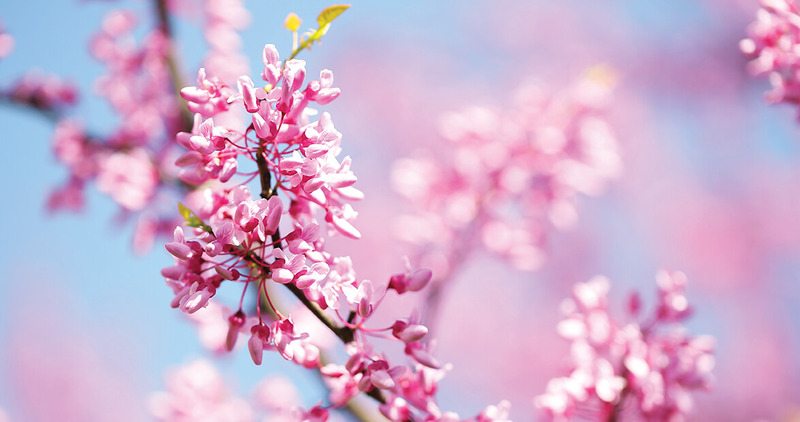 According to the story, the redbud’s flowers were originally white, but turned pink with shame after Judas’s dirty deed. All in all, it’s a lot of ground to make up. The redbud’s broad, round, heart-shaped leaves seem almost an apology. Part of the redbud’s charm is its laid-back character. Happy to play second fiddle, it rarely elbows its neighbors. But the redbud has its more modern fans. Native Americans used redbud bark to treat dysentery. Early pioneers polished off the redbud blooms in salads or as a snack. In some parts of Mexico, they are still fried and pickled. George Washington loved the eastern redbud. He transplanted the trees from the wild Virginia woods to his Mount Vernon gardens, and once planted a circle of dogwoods with a redbud in the center. Thomas Jefferson had them planted at Monticello and Poplar Forest, his foothills retreat. Part of the redbud’s charm is its laid-back character. Happy to play second fiddle, it’s content in the forest understory, and rarely elbows its neighbors. The redbud is no braggart. During the summer, it takes a back seat to all the soaring hardwoods, the leafed-out oaks and beeches and poplars. The redbud puts on a yellow burst of autumn color, but even then it comes across as an afterthought, really, lost in seas of blazing reds and oranges. Once it drops its leaves, the redbud goes largely forgotten. And then one day, say, long about late March, it dawns on me that I’ve forgotten what warm sun on bare skin feels like. At about the same time, it might occur to me that I have no idea what I did with my flip-flops, and that it wasn’t very long ago that I craved a mug of hot soup, but no, what I really want now is a decent garden tomato. I will think: When will this winter be over? And there it is. The road curves or the trail tops the rise and suddenly, out of nowhere, I see the first redbud of the infant spring. The magenta flowers cling tightly to dark branches, as if even they aren’t quite sure if it’s safe to come out so early. And once I spot that inaugural redbud, it seems like they’re everywhere: Trooping down the mountain valleys, ganging up along a sunny glade in the pines, lining the interstates. I see just one redbud and it is spring once again, rushing back each year with the soft strains of violins and kettledrums and mountain streams and the faint aroma, I’m afraid, of that deliciously crisp onion-flavored corn snack. Redbuds, Aaron Copland, fly-fishing, and Funyuns. Forever together.